This past April, the Los Angeles City Council joined the Mayor in voting unanimously to support Assembly Bill 1634 – The California Healthy Pet Bill, – a bill designed to abate the incalculable suffering of unwanted lost and homeless dogs and cats in the State of California. Yesterday, LA City’s Public Safety committee voted unanimously to support a spay/neuter ordinance designed to address the specific needs of the City of Los Angeles. Many of us face the harsh realities of pet overpopulation every day as we take in, care for, and ultimately kill too many of the animals in our charge. If insanity is defined as doing the same thing over and over again expecting different results, then this ordinance gives us a tool to end the insanity and do something significantly different. This Friday, February 1st, the entire LA City Council will vote on whether this ordinance should become law. If it is enacted, this ordinance will help end the cycle of frustration we all face and feel every day. This ordinance will allow us to eventually reallocate precious resources toward increasing adoption, educating the public on humane issues, and fight animal cruelty. 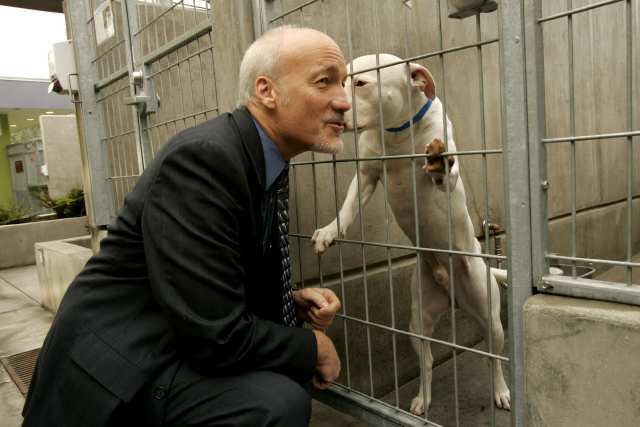 Several years ago, the City of Los Angeles became a national leader by committing itself to ending euthanasia as a methodology for controlling pet overpopulation. This commitment was demonstrated by an allocation of $160 million to build seven new animal care centers to manage the crushing number of lost and homeless animals rescued by LA Animal Services every year, over 50,000 animals. This commitment was further demonstrated over the past six years by the City Council who, in concert with the Mayor, provided the support the department needed to staff the new facilities, increase our spay/neuter programs and move this city to the forefront of the nation’s drive to become truly animal-friendly. This unflinching commitment to the health, safety and welfare of our community’s pets has taught us an important lesson: that addressing the pet overpopulation problem from the back end is expensive. Building bigger and better shelters is similar to trying to mop up a flooded basement without first fixing the broken pipe. Until we turn off the faucet that is pouring thousands of unwanted dogs and cats into our City shelters we will never gain control over the homeless animal explosion. This new ordinance is a tool that can propel us toward a day when we can finally end the killing of animals because we lack the room in our shelters for the seemingly endless flow of 150 newcomers on average per day. On behalf of the nearly 50,000 animals Animal Services rescues every year, and the over 400 employees, and the hundreds of volunteers and partners we have throughout Los Angeles who feel the brunt of pet overpopulation every day, I ask you to ask your City Council representative to support this important ordinance on Friday. If you can’t make it, please contact Councilmember Alarcon’s office via this e-mail: Councilmember.Alarcon@lacity.org or by phone (213.473.7007) or fax (213.847.0707) to express your support of the ordinance and to thank him for his leadership on this important issue.